Many people will or have signed a liability waiver without reading or without a second thought? Have you? Waivers, releases, assumption of risks, and indemnification clauses are used by businesses, companies, schools, and organizations to reduce their risk exposures and claims against them. A waiver is generally a voluntary relinquishment of a known right and is executed prior to the activity. Basically, a participant surrenders their negligence-based personal injury claim against a business or company. This means the participant agrees to "hold harmless" the organization if they are injured. Some businesses require the signature on a legal contract, document, or agreement in order to participate in the activity. Companies use waivers to prevent injured parties from suing them, limit where one can bring a lawsuit, and even force you to arbitrate your dispute. Where do you see waiver today - almost everywhere. In addition to extreme sports like skydiving, bungee jumping, scuba diving, or parasailing, they are used in amusement parks, gyms, fitness centers and athletic programs. Waivers are common in rentals of equipment, wave runners, boats, bounce houses, and more. They are also common in the work place where there are exposures to elements or work dangers (ex. lab exposures). Before signing a waiver, you should read it and understand everything in the waiver. Not all waivers are the same. 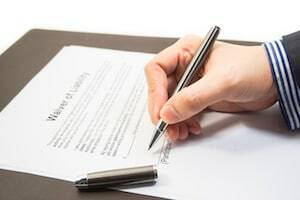 If you don't understand something or are uncomfortable with something in the waiver, you should not sign it or see if you can modify the waiver. You want to ensure that you do not sign your rights away in some instances. A serious injury or death that you cannot collect on can be devastating to the injured and/or their loved ones. When possible, you should show your lawyer the waiver to make sure your rights are protected, and they may also be able to negotiate with the company to protect those rights. Never assume a waiver is unenforceable. Always talk to a lawyer. Waivers can be valid in Florida for regular or ordinary Negligence - The failure to use or exercise ordinary and reasonable care under the circumstances. A waiver may be invalid if it violates certain criteria or attempts to waive your rights to recover for intentional torts such as fraud, assault, or battery. Typically you do not surrender your right to sue for injury claims based on reckless or intentional conduct. READ THIS FORM COMPLETELY AND CAREFULLY. YOU ARE AGREEING TO LET YOUR MINOR CHILD ENGAGE IN A POTENTIALLY DANGEROUS ACTIVITY. YOU ARE AGREEING THAT, EVEN IF (name of released party or parties) USES REASONABLE CARE IN PROVIDING THIS ACTIVITY, THERE IS A CHANCE YOUR CHILD MAY BE SERIOUSLY INJURED OR KILLED BY PARTICIPATING IN THIS ACTIVITY BECAUSE THERE ARE CERTAIN DANGERS INHERENT IN THE ACTIVITY WHICH CANNOT BE AVOIDED OR ELIMINATED. BY SIGNING THIS FORM YOU ARE GIVING UP YOUR CHILD'S RIGHT AND YOUR RIGHT TO RECOVER FROM (name of released party or parties) IN A LAWSUIT FOR ANY PERSONAL INJURY, INCLUDING DEATH, TO YOUR CHILD OR ANY PROPERTY DAMAGE THAT RESULTS FROM THE RISKS THAT ARE A NATURAL PART OF THE ACTIVITY. YOU HAVE THE RIGHT TO REFUSE TO SIGN THIS FORM, AND (name of released party or parties) HAS THE RIGHT TO REFUSE TO LET YOUR CHILD PARTICIPATE IF YOU DO NOT SIGN THIS FORM. If a waiver or release complies with the above and waives no more than allowed under the statute, there is a rebuttable presumption that the waiver or release is valid and that any injury or damage to the minor child arose from the inherent risk involved in the activity. So GONE are the days that you sign a waiver believing it to be unenforceable. In addition, A waiver can be enforceable in non-commercial contexts such as a school sport or activity. However, that waiver must be signed by the minor's parent or guardian. A child can not waive their rights. Finally, ask if it is necessary to sign the waiver or why it is needed to participate. In some cases, you may learn that you do not need to sign the waiver to participate. If that is the case, do not sign anything. Never sign a waiver after an accident. If you do sign a waiver, always keep a copy of the waiver in safe place where you can access it now or in the future if needed.